I'm very much of a lipstick and foundation person ever since i've started wearing make-up. I hardly put on eyeshadows, eye-liners nor mascaras, blushes too. I usually put on my foundation. Be it liquid based or creme based it doesnt matter as long as it smoothens the complexion and smoothes the skin. I absolutely adore lip glosses. I like to smack on lovely glossy pink gloss. Thats usually all that i do thus i dont take the usual 1 hour to get ready, I can do my make-up in 5 minutes. No sweat. However, couple years ago i started to experiment on blushes and discovered that it is such a great invention!! haha....If applied perfectly it can create a very fresh and radiant look to your face, not forgetting the ability to slim down the cheeks too. As i've currently mastered the art of applying blush its been part of my make-up routine eversince. Personally, i will never ever recommend anyone to buy compact blush that comes with small brushes that is of equal size with eyeshadow brushes. This is bcos well, it should never have been invented in the first place. Its a great big nono to use tiny brush to apply on your blush as it will definately appear awkward and clownish. not practical to pack the huge brush in your purse so compact blush is the best alternative, therefore I've searched for a good compact blush with large brush. 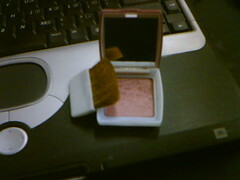 Last year I was really glad because I found what i was looking for in Loreal Blush Delice. 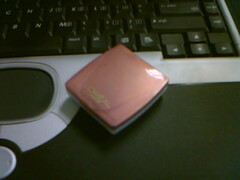 Loreal Blush Delice is one of the best around. I love the fact that it is small and compact, the color is absolutely beautiful, when opened up you have quite a large size mirror intact which is great because it allows you to see your whole face. Plus id like to give triple plus points to the application brush!! Its just so wonderful. The brush is large enough to ensure smooth application and very soft too. This really help to apply blush to the cheeks evenly and creating a tint of pink radiance. Lovely lovely. Maybe you can give it a try too! I know i love mine. Hahaha...I love blushes too. Like you, I only use foundation (smooth skin is a must for me) but now, tambah mascara and blusher already. I love love love blushers. Heehee. i use blush delice too! Speaking of foundation, have you tried Revlon's Sheer Cashmeer? I hate using foundation because it's a b*tch to apply but this one is like a dream! Light and smooth. Yay more make-up reviews, I love reading them! I too have discovered the pow-ah of blush in the last couple of years. I love the powder blush from Stila and the cream blush from NARS. Actually lately I have been feeling the urge to buy eyeliner. Know any good ones?